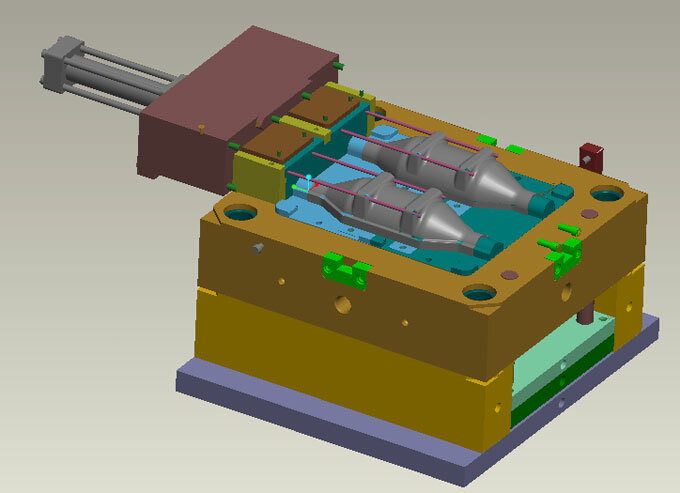 What are the basics of plastic injection mould designing? Now we will introduce the following 10 steps! Examined and signed formal system part drawings, and indicate the plastic grades, transparency, etc. Plastic part specification or technical requirements. Usually the design task document is proposed by plastic mould design personnel according to the mission statement to the mission statement. The document is the basic of injection mould designing. Collect the basic parts design, injection moulding process, injection moulding equipment, machining and special processing information in order to prepare for plastic mould design. 1. Understand the use of parts, analysis the process, dimensional accuracy and other technical requirements. Acknowledge the outer shape, color transparency, performance requirements, geometry of plastic parts, slope, inserts, extent permitted welding marks, shrinkage and other moulding defects, with or without coating post-processing equipment, electroplating, gluing, drilling and so on. Select the dimensional accuracy of plastic parts up to the size of the analysis to see whether the lower than estimated molded plastic parts tolerance, the ability to meet the requirements of the moulding of plastic parts too. Also, learn plastics and plastic injection moulding process parameters. 2. Analysis and imply the moulding method, equipment type, material specifications, and other requirements of the injection mould structure. The moulding material should meet the strength requirements of plastic parts, having good flow ability, homogeneity and isotropy, thermal stability. According to the use of plastic parts, injection moulding materials should meet the stained condition metallized, decorative properties, the necessary flexibility and plasticity, transparency or reverse reflection performance, bonding or welding properties and other requirements. 3. Determine the moulding method-using direct pressure method, pressure casting or injection moulding method. Depending on the type of injection moulding equipment, therefore it must be familiar with all kinds of equipment performance, specifications and features. For example, the injection machine, you should aware of the following specifications: injection capacity, clamping pressure, injection pressure, mould installation dimensions, top of the device and the size of the nozzle hole diameter and spherical radius nozzle, sprue bush positioning ring size, die maximum and minimum thickness. 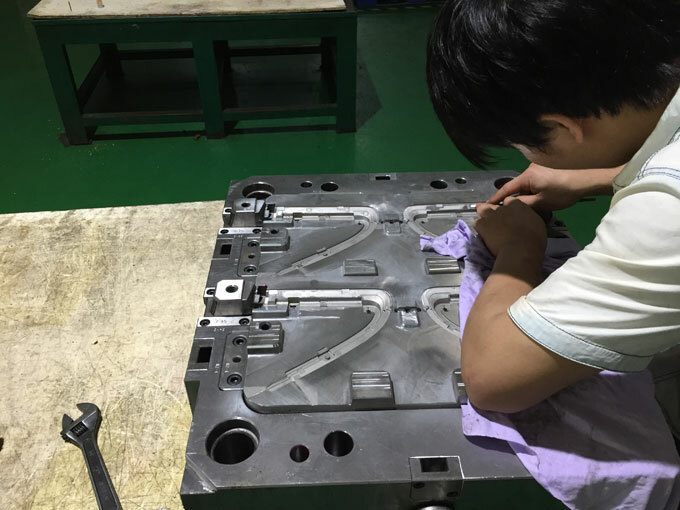 To preliminary estimates mould dimensions, it is determined whether the plastic injection mould is installed and used on selected injection machine. Such as pressing mould (open, semi-closed, closed), die casting, injection mould, etc. Select the desired mould structure is to determine the necessary moulding equipment, the ideal number of cavities, make injection mould itself to work in conditions of absolute reliability of the plastic parts of the technology and production economy. Plastic parts for the technology requirements is to ensure that the geometry of the plastic parts, surface finishes and dimensional accuracy. Production economy requires low cost to make plastic parts, high production efficiency, the plastic mould can be continuously working, long life and save labor. Cavity arrangement. According to the geometry of the characteristics of plastic parts, dimensional accuracy, batch size, ease of mould manufacturing, mould costs and determine the number of cavities arrangement. Determine the parting surface. Location of the parting should be conducive to injection mould, exhaust, stripping and moulding operation, plastic parts surface quality. Determine the gating system (main runner, runner and sub gate shape, location, size) and exhaust system (exhaust method, the exhaust slot position, size). Select the ejection mode (jacking, push plates, combined ejection), decided the undercut processing method and core pulling mode. Determine cooling and heating method, as well as groove shape, position and heating element installation. Use the mould material strength calculations or empirical data to determine the thickness, shape and structure of all connections, location, location guides of the injection mould parts. Determine the structure of the main forms of molded and structural parts. Consider the strength of the various parts of the mould, and calculate the size of moulding parts. If these issues were resolved, the formal structure of the plastic injection mould naturally solved. At this point, we should start drawing the mould diagram. Draw the diagram according to national standards, but also requires combined injection mould factory standards and national regulations are not the customary factory painting. Before drawing the mould assembly diagram, the basic process chart should be drawn, and to meet the requirements of the parts diagram and process data. Write the words "process dimension" noted in the chart by the following procedure ensured size. 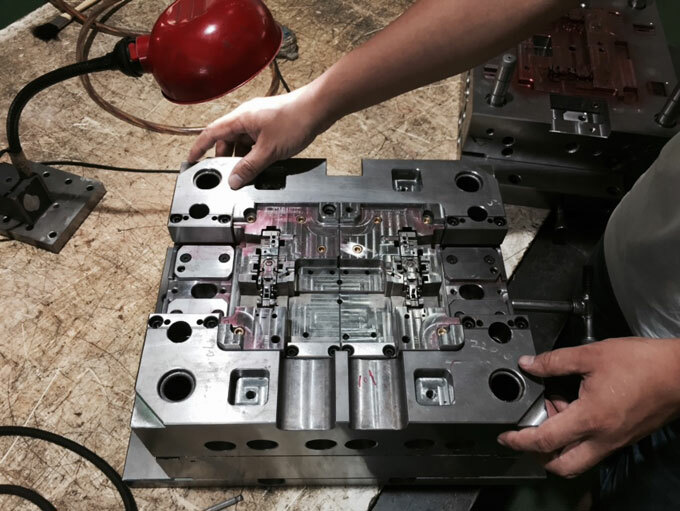 If the injection mould carries out no other machining, the process drawing will be the same as the diagram. In the process diagram, it is better to mark article number, name, material, material shrinkage, drawing scale and so on. 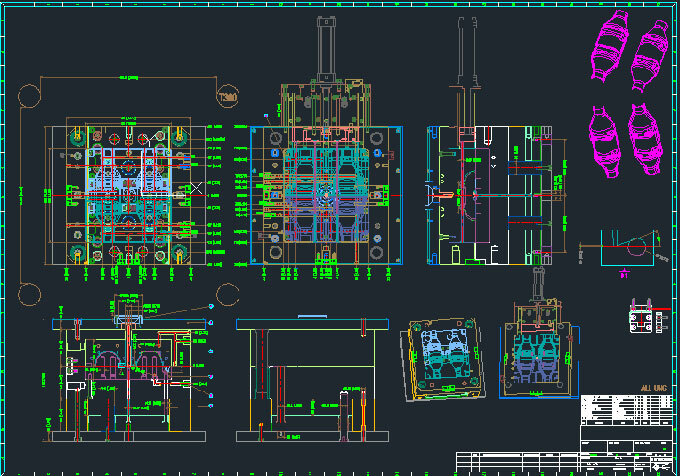 Generally draw the process diagram on the mould assembly diagram. Try to draw the assembly diagram in 1:1 ratio, start first by drawing the cavity, a front view and other views should be simultaneously drew. Gating system and exhaust system structure. The sub-surface and pick parting method. Outline structure and location of all connections, positioning and guiding elements. 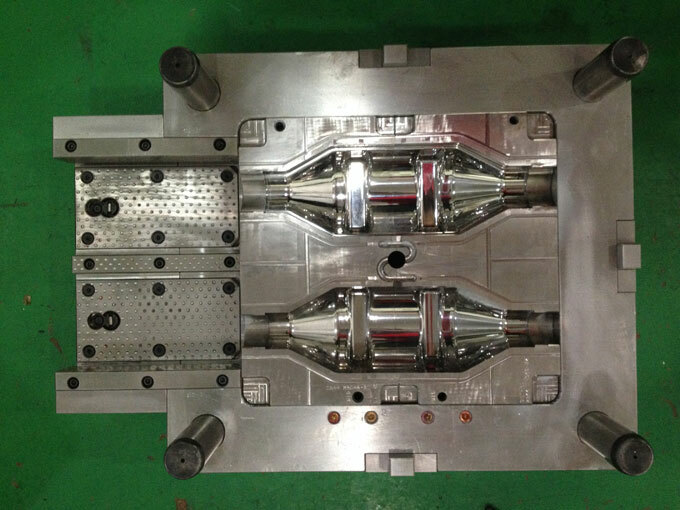 The cavity height dimension size (not force, if necessary) and the overall size of the injection mould. Auxiliary tool (pick unloading modeling tools, calibration tools, etc.). Number all the parts in order and fill the schedule. The labeling requirement and instruction. Mould system performance requirements, for example, the ejection system, pulling slider assembly installing requirement. The mould assembly process requirements. For example, after bonding surface of the mould assembly parting bonding gap should be less than 0.05mm, the following parallel degree requirements, and noted that the size of the assembly decision and the size requirements. The use, assembly and disassembly method of the plastic injection mould. Anti-oxidation treatment, mould number, lettering, tags, seals, storage and other requirements. Mould testing and debugging requirements. Sequence of drawing parts diagram from injection mould assembly: inner-outer, complex-simple, molded part-structural components. Graphics requirements: according to a certain proportion, allows zoom in or out. Reasonable view, correct projection, properly arranged. To make the process easy to understand, easy to assemble, as far as possible consistent with the general assembly drawing graphics, graphics should be clear. The dimension requirements should be unified, focused, orderly and complete. Dimensioned order: first mark major part size, and then marked with the size and dimension of all sizes. Mark fit dimension of non-main part, and then mark all sizes. The surface roughness. The most widely used roughness standard should be marked on the upper right corner. Other roughness symbols are marked on the surface of each part. Other content, such as part name, mould drawing number, material grade, heat treatment and hardness requirements, surface treatment, drawing scale, free size precision and technical notes should be correctly filled. See the mould and die parts material, hardness, dimensional accuracy and structure meets the requirements of the plastic part drawing. Plastic flow stream, shrinkage, weld marks, nicks, and whether the draft is affecting performance plastic parts, dimensional accuracy, surface quality and other requirements. Have inadequate designs, whether simple processing, shrinkage of the injection moulding material selection is correct. Injection amount, injection pressure, clamping force enough, and Xiao muzzle nozzle mould installation, plastic parts of the core, stripping any problems, injection machine is correct contact. Parting surface location and finishing precision meets the needs of the overflow will not happen, if we were to ensure that plastic parts remain in the top side of the device there. Release mode is correct, the promotion of the rod, push pipe size, location and number is appropriate, push plates will not be stuck in the core, it will not cause abrasion moulded parts. Mould temperature control aspect. The heater power, number; the flow of the cooling medium line position, the size, the number is appropriate. The method of processing plastic parts made undercut, undercut removal mechanism is appropriate, such as bevel pillar core pulling mechanism of the slider and fader whether mutual interference. Pouring, position of the exhaust system, the size is appropriate. Part Number Part diagram, name, number of copies produced, manufactured or purchased parts within, is the standard or non-standard parts, parts with processing accuracy, precision molded plastic parts at the size of the correction processing and the balance mould parts of the material, heat treatment, surface treatment, surface finishing level is marked, clearly described. Part main parts, injection moulding parts with the size and dimensions of the work. Size figures should be correct, do not allow producers conversion. Check all parts drawings and assembly diagrams of view position, the projection is correct, drawing painting meets the national standard, whether the omission size. Geometry, drawing views and dimensions standard of all parts should be conducive to processing. Professional proofreading according to the principle of self-proofing project designer. But it should focus on the structural principle, process performance and operational safety. Digest the diagram according to the national standard description, and fill in all dimensions and technical requirements. Sign your name after the description. Give the diagram to the designed for checking and sign, practices are reviewed by the tool manufacturing units of the technical staff, countersigned inspection of the manufacturing process, before they can be blueprint. Write the manufacturing process card, the tool manufacturing units write manufacturing process cards, and ready for processing. In the processing of plastic injection mould making, it should strengthen the inspection, which focused on the dimensional accuracy. 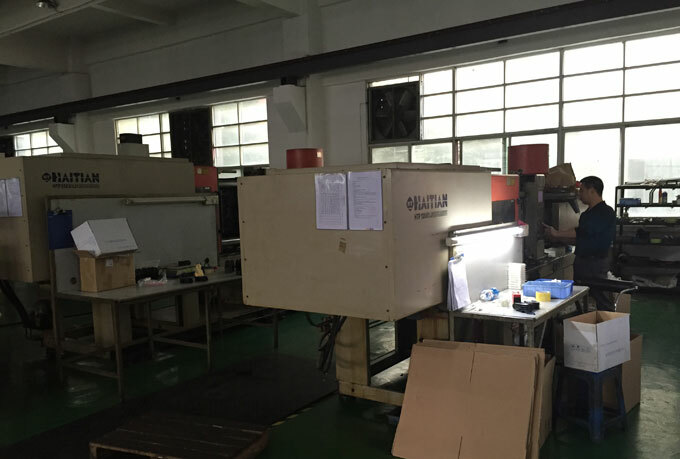 After the injection mould assembly is completed, it will be tested by the inspectors in accordance with the table. Mould testing is majority on performance. This is the only way to see the manufacture quality. Although the plastic injection mould is designed under selected material, moulding equipment and desired process conditions, but the awareness is often imperfect. After the completion of mould, the trial test should be taken to see the quality. If there are errors, we can modify the injectoin mould. The reason of plastic parts undesirable is very complex, there are reasons for moulds and process conditions, both of which tend to pay only together. Before the repair the injectoin mould, it should base on the actual situation of plastic parts appear undesirable phenomena, careful analysis research to identify remedial measures after the cause plastic defects. Because the moulding conditions are easy to change, so the general practice is to change the injection moulding conditions when the change does not solve the problem, before considering repair mould. Repairing mould should be careful. The reason is that once you change the condition of the mould, you cannot make a big transformation and restitution. After the test, if the plastic injeciotn mould is not being used, it should be completely erased release dross, dust, oil, and then coated with oil or other rust inhibitors, keeping close to the storage site. Collect all the basic technical documents from the mould designing to finish processing, such as the mission statement, parts diagrams, technical manuals, assembly drawing, mould parts diagram, underlay, mould design specification, inspection records and repair records according to the provisions of systematically sorting, stapling, numbering archived. This seems to be a lot of trouble, but it is very useful for mould maintenance and new mould designing.